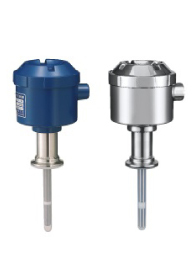 This level switch is designed for the level of hygiene required in the production processes of foods, pharmaceuticals, and cosmetics. It is easily washed clean and resistant to chemical agents. It can be used in a variety of fields. The sensor is completely covered by a PFA tube that is integral to a ferrule gasket so that there is no connecting area of multiple parts. Grooves for joints can get clogged with foreign substances. This sensor solves these problems. It withstands 150 degrees, pressure up to 0.5MPa, and can be used for SIP and CIP washing. If there are connecting areas, liquid may penetrate and remain there. Further, gloves for joint may occur clog of foreign substance. These may cause sanitary pollution and bad odors. This probe solves these problems. All the liquid-contact parts are coated with PFA (fluorine resin) in order to stand up to acids and alkalis. Material that complies with the food hygiene law is used for the liquid-contact parts (PFA). Reliable waterproof casing (IP68) that can be used in various working environments. The switches can be used in any location in the world and can handle power from 20 to 250 volts, AC or DC. When the power supply is 24VDC used in the integrated sensor has obtained the CE marking. The sensor does not have mechanical seals. The sensor can detects almost all liquids including both conductive and insulating materials. Ex. : Detecting levels of pure water, hot water, cold water, drinking water, juice, dairy products, edible oils, margarine, mayonnaise, chocolate, alcohol, washing agents, foams, interfaces between oil and water, etc.